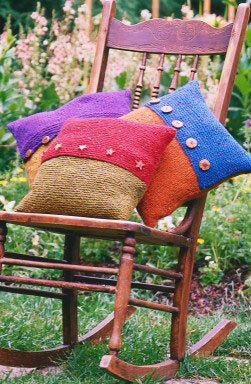 Pillows are semi-quick knits with a lot of variations — and knit pillows look great on your favorite chair or couch. Knit a button pillow or two (or a dozen) for useful gifts from the heart. Cast on your gauge per inch times 14 (the pillow form’s width), plus 4 extra stitches to allow for easy seaming on either side. So, if your yarn is 4 stitches to the inch and you’re making a 14-inch wide pillow, you need to cast on 60 stitches ([4 x 14] + 4). Knit until the piece measures two times your pillow’s height, plus 4 inches; then bind off and block. Blocking prevents your knitted work from curling. Fold the bottom of the piece up until you have a 14-x-14-inch square and seam the sides. This step creates the body of the pillow. Create your loop closures and sew them into place. You can knit a wide variety of loop closures — just make sure they’re long enough to reach around each button. Fold the 4-inch flap over the top and stitch on your chosen buttons. Put them into place evenly below the bottom edge of the flap.